Join now on our 2 Summers Full Introductory and Introductory Memberships. Play until 30th September 2020. Introductory memberships from only £820. This membership offer is only available to first time applicants and is not open to current or former members of the Club. One of the benefits of being a member of a golf club is that you don’t have to play 18 holes every time you go out if you dont want to and you get great value for your membership. If you don’t always have the time to play 18 holes of golf, you can go out late afternoon on a weekend or weekday, or on a weekday evening and play as few or as many holes as you want to. Our course lends itself to playing shortened rounds, if you just want to blow away the cobwebs or get a bit of extra practice. The first 10 holes bring you back to the clubhouse or you can play the back 8 holes, provided the way is clear. There are various alternative permutations, involving 5 or 6 holes from the first 10 holes or just play from the 11th to the 16th. You can really get full value out of a club membership as you don’t have to pay or play 18 holes, every time you play. Make the most of your valuable time and get out in the fresh air, whenever it suits you. George was elected Club Captain at the AGM on Friday 7th December 2018. On behalf of our members and staff, I wish you a very warm welcome to Cathcart Castle Golf Club. 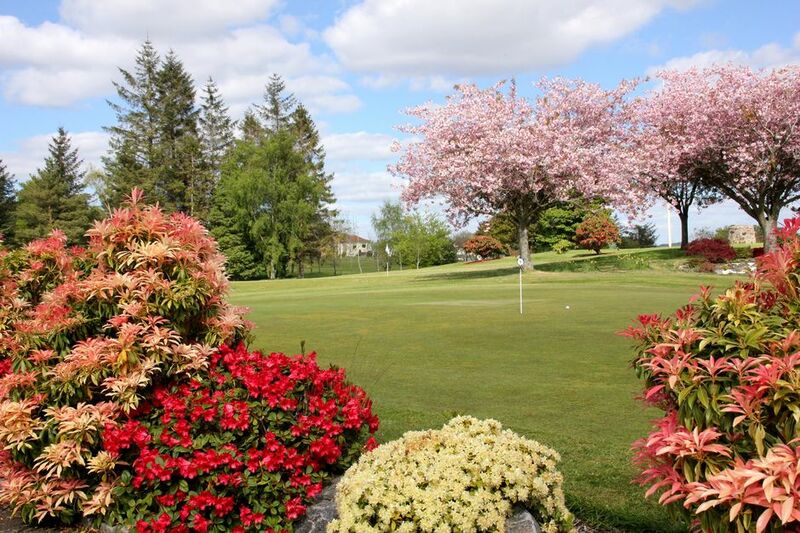 We offer a mature, challenging 18 hole parkland course which has recently been widely praised for its excellent condition particularly our greens which are superbly maintained by our head greenkeeper Scott Davidson and his staff. The course is one of the oldest in the area and has outstanding views of Glasgow and beyond. We are known for being a friendly club offering excellent facilities to visitors and our members. We run several Open competitions during the year in addition to members competitions covering all genders, ages and abilities. We offer a full catering and bar service in the clubhouse and can accommodate visiting parties and private functions. Our PGA Professional, Stephen Duncan together with his assistant Nikki Ferguson provide coaching, trolley hire and repair services and sell leading brand stock at competitive prices. Please explore our website for further information on what we offer at the club. David and Alan in the office will be delighted to provide more detail and explain our membership offers to you. The members here are very proud of our club but don’t take our word for it. Come and pay a visit to Cathcart Castle Golf Club and see for yourself. All of the membership categories noted below are currently available. These offer immediate entry to the club upon full payment of the amounts noted, flexible finance options are available upon request. For further information on any of the memberships please email the Managing Secretary or contact us directly on 0141 638 9449. All playing membership prices include Golf Union fees. Admission to membership is conditional upon receipt of a completed membership application being communicated on our notice board for 2 weeks and receipt of the full subscription payment. We offer payment by instalments via our recommended finance provider, Zebra Golf Finance, who will charge you a fee for this service. # Entry fee is currently not applicable to new age specific adult members or new Lady Members. Adult males aged 30+ can benefit from our "18 for 12" offer on Introductory and Full Introductory Membership, when taking a new membership between 1st September & 31 March 2018. Pay the normal annual subscription as noted above but play for 18 months from start date, without having to commit to an entry fee. Full - this category offers unrestricted golf throughout the year, including competition play and full use of the clubhouse facilities. Full members are also entitled to vote on club matters. Age specific adult Member - Open to age ranges between 18 to 21, 22 to 25 & 26 to 29 years old.​ See note #below . Introductory - The use of all clubhouse facilities are available. No entry fee is payable in the first year, but on the 1st anniversary of your joining, you must apply for full membership or leave. The entry fee #* is payable at that point subject to agreed payment terms. Rights & Limitations: No voting rights until a Full member. No knockout competition or Saturday medal play. However, can play in Tuesday, Thursday and Sunday medals. Offer only available to new members. Introductory Full – same playing rights as a Full Member but no equity or voting rights. On the 1st Anniversary of your joining, you must apply for Full membership and start paying your entry fee #*. Offer only available to new members. *£900 Entry fee payable £15 per month over 5 years or £25 over 3 years. Entry fee can also be paid in full at the time of joining at a cost of £750 - a saving of £150. Junior - We encourage juniors to apply to join the club. Juniors have full access to the course on Monday, Wednesday, Friday and Sunday with restricted availability on other days. They have access to clubhouse facilities. 1 . If there are 2 juniors or more, who are from the same family and neither parent is a member the 2nd child pays half the annual subscription (£100) and the 3rd child and any subsequent child pays 1/3rd (£66.67). Social - Social members have full use of all the clubhouse facilities. Reciprocal Golf available to members: . Milngavie Golf Club and Bonnyton Golf Club -members may play at these courses by arrangement. Playing times may be booked by contacting the Managing Secretary . The 1895 Club of which Cathcart Castle is a member was formed by a number of clubs, all celebrating their Centenary in 1995. All members of the 1895 club ​offer reciprocal courtesy of the course to visiting members from other 1895 clubs. Mearns Castle Golf Academy and Playsport (East Kilbride) - members are entitled to discount on range balls during certain weekday evenings. If you introduce a new golfing member aged 18 or over and they renew their membership after their initial introductory membership period, and they commence the payment of a joining fee, if applicable, you will get £100 bar card credit added to your clubhouse account, once they have made payment of their renewal subscription. Your name needs to be on their application form as the proposer for you to be the recipient of this £100. If you have been a member less than 3 years and are not permitted to propose them on the application form, insert your name against the space on the form for the “Introducer”. Our membership rates & categories are shown in the table further down the page. Ladies & Gents aged 30 years or over can join now and receive membership until 30 September 2020*, offer runs until 30 September 2019. No Entry Fee for first period of membership. Take advantage of this unique offer today by contacting us on 0141 638 9449. Our other membership rates & categories are shown in the table further down the page. *When taking out Full Introductory or Introductory Membership between 1st April and 30 September 2019. Under 30 years - join for a year and never pay an entry fee. Each membership provides a Corporate Day for 20 guests and a maximum of 10 delegates per year. Many more benefits. If you would like to apply for a Corporate Membership at Cathcart Castle please contact the Managing Secretary or call us on 0141 638 9449. The Council of Management would like to inform the members, of the provisions of the Club’s liability insurance policy, relating to accidental injury to persons on the course, or damage to property.